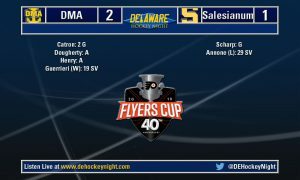 Philadelphia, Pa. — After upending in-state rival Salesianum to claim the Delaware Cup last week and again to advance to the 2019 Flyers Cup championship game, the Delaware Military Academy Seahawks found themselves overpowered by the Eastern Regional (N.J.) Vikings, 7-2, in a penalty-laden contest on Sunday morning (March 17) at the Wells Fargo Center. In total, 80 penalty minutes were issued to both teams, including three misconducts. Eastern’s special teams took full advantage of the situation, accounting for three power-play goals as well as a short-handed tally. Following a lone first-period goal from Jacob Findley, which he scored unassisted 8:57 into the game while DMA’s Andrew Henry was serving an interference minor, the Vikings kicked on the afterburners in the second, reeling off four straight goals in the first half of the second period. Vikings leading scorer Conor Riley, who averaged over two points a game through the South Jersey High School Hockey League (SJHSHL) regular season, completed a natural hat trick in a matter of 4 minutes and 23 seconds, lifting Eastern to a 4-0 lead 7-1/2 minutes into the middle frame. Sean Pomerantz’s power-play goal at 8:21 put the Vikings further out of reach before Justin McGee scored his final goal as a Seahawk from an Alex Maglio assist at 10:08. Gunner Rogers responded for Eastern with 3:12 left in the second, putting DMA at a five-goal deficit with a period to play. DMA failed to convert on their first five power-play chances, but Maglio connected off an Aidan Danese assist to bring the Hawks within four with 12:25 to go while Kristopher Zapata was off for interference. Zapata himself came back 70 seconds later to restore the Vikings’ five-goal advantage and keep DMA well out of reach in a third period which saw 38 of the 80 penalty minutes doled out, including misconducts to both Aaron Catron and Danese of the Seahawks. Anthony Guerrieri was peppered with 37 shots in his scholastic hockey curtain call, and he recorded 30 saves in defeat. Eastern’s Max Brzozowski stopped 31 of 33 shots he faced. 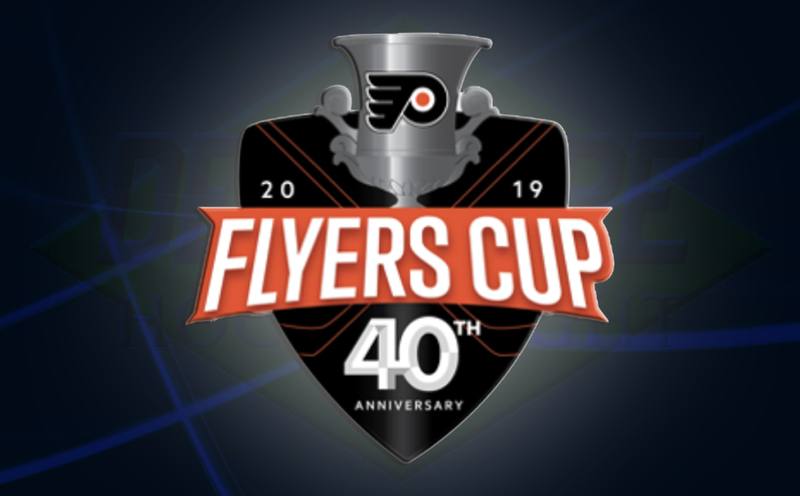 The Flyers Cup returned to the Garden State for the first time since 2016, when Cherokee beat Salesianum, 5-3.